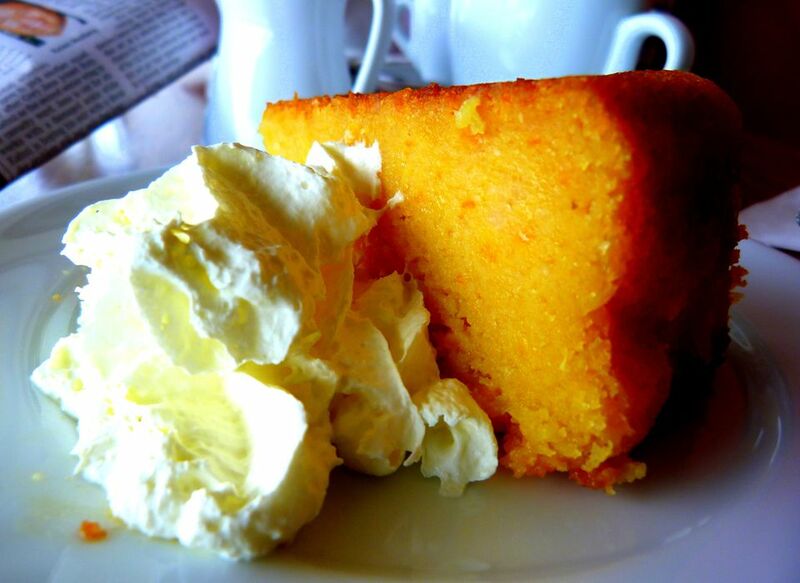 This delicious cake is just popping with orange flavor! Dense and moist, this cake makes a very satisfying end to a good meal or goes wonderfully with coffee. It can be prepared well in advance and then sliced up quickly and served with the mascarpone cream and orange syrup when guests arrive. Put the oranges into a large pan and cover with water. Bring water to a rolling boil, then turn down to a good simmer. Place a small plate on the oranges to keep them submerged and cook for 2 hours. Remove the oranges and set aside. Reserve the cooking liquid. Place the granulated sugar and honey in the bowl of a food processor. Add the eggs. Blend until the mixture is smooth and fluffy. After the oranges have cooled enough to safely handle, cut them into medium-sized pieces (peel and all). Remove any seeds and add to the processor. Blend until smooth. Add the almond flour, salt, and baking powder and blend to combine. Grease a 9-inch springform pan with butter and line with baking parchment, then butter the parchment paper. Use a rubber spatula to scrape the cake mixture from the processor into the pan. Bake in the preheated oven for 1-1½ hours. Test the cake with a toothpick inserted into the center of the cake. If it comes back out mostly clean then the cake is cooked. Let cake cool in pan before removing the springform ring and bottom. Pour the reserved cooking liquid from the oranges into a large pan. Add the sugar, the zest of an orange and its juice. Bring to a boil for 10 minutes or until thick and syrupy. Let cool. Use a stand mixer or hand mixer to beat together the whipping cream, Mascarpone, sugar, and vanilla until soft peaks form. Transfer slices of the cake to individual serving plates. Top with a dollop Mascarpone cream. Drizzle a little orange syrup over the top.